FROM ESTATE: FABULOUSLY BEAUTIFUL "R S PRUSSIA" "ROYAL VIENNA" CREAM AND SUGAR WITH LID. IMPRESSIVE SIZE AND VERY BEAUTIFUL. WHITE WITH LILAC COLOR SHADINGS, CABBAGE ROSES WITH GREEN LEAVES. GORGEOUS HANDLES. Sugar has a lid. Pink & Yellow Rose with Gold Details - Shades of green background. You get exactly what you see in the pictures. O&EG Royal Austria. Sugar bowl with lid—-holds 1/2 cup of sugar. Made in Austria. 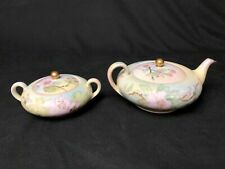 CREAM & SUGAR, ANTIQUE, SO DELICATE, PINK FLOWERS WITH GOLD TRIM, CREAMER 2 1/4" T X 2" WIDE, SUGAR AT 1 3/4" TALL X 3" WIDE. GOOD CONDITION, ESPECIALLY FOR AGE, CREAMER HAS A TINY BLEMISH, SEE PICTURE. -- I CAN'T TELL IF IT WAS AT MANUFACTURE OR GOT A TINY CHIP SOMEHOW...??? HARDLY NOTICABLE, OTHERWISE SUCH A PRECIOUS, DELICATE, COLLECTOR'S SET. Embossed design along rim and around the base. Sugar Bowl with Lid ~ 5” tall with lid & 3-1/2” without lid x 5-1/2” long x 5-1/4” wide. Antique T&V Hand Painted Limoges porcelain France. Pink Roses w/ Gold trim details high Relief paint. The bottom is artist signed and dated 1948. It is all hand painted. Noritake Azalea Pattern. Made in Nippon 1891-1921 Japan. Cream Pitcher And Sugar Bowl. Near The Base Of The Sugar Bowl. Hand Painted With Gilding. And Raised Moriage Accents. Bowl is 2"H. Actual color may vary due to lighting conditions. See column to the right. no exceptions . White With Red And Pink Peonies. Made In England By Royal Grafton. And Gold Gilded Rims. Cream Pitcher And Sugar Bowl. Marked Fine Bone China. Theodore Haviland New York. Apple Blossoms Pattern. Pedestal Sugar Bowl And Cream Pitcher. Made In USA. White With Pink And Light Moss Green. Ruffled Edge with Gold Trim. Elegant Hand painted flowers with pink ruffled top and gold trim. with Pink Roses. Made in Japan. The porcelain is a delicate blush pink highlighted with gold and the pattern is a spray of colorful spring flowers. Lovely set. Ready to use. Nice enough to give as a gift! Purchasing from us?. Royal Albert Bone China Made in England Sugar and Creamer "Tea Rose"
Made in Nippon 1896 -1921 Japan. Used By Noritake Morimura. Pink Roses And Moss Green Leaves. Sugar Bowl And Cream Pitcher. Hand Painted White And Light Sky Blue. Rising Sun Trademark. The underside is marked "TK-2 11". The set is in excellent condition with no flaws to it. Arrives to you ready to use, gift, collect or display. No gold loss. LOVELY ANTIQUE CREAM AND SUGAR SET, PORCELAIN Hand Painted with Gold Trim. Signed Axford. No chips! Beautiful pieces! Excellent Condition! Shipped with USPS Priority Mail. They have NO paint loss, crazing, cracks, nicks, scratches, abrasions, spots, discoloration or repairs. The sugar spoon is freshly polished. Both stand perfectly level with personality plus. Ready to use, display and admire. I find it hard that they can take away my hard earned status. I really do the best I can. 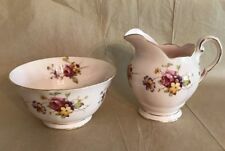 Vintage Royal Albert Evesham Sugar Bowl & Creamer Pitcher Bone China England 3"
3 piece Cream & Sugar Set. Bright pink, white, gold detail and farm-village-scenery designs. Sugar bowl height ~ 4"- with lid ~5" widest part ~ 3 1/2". Minor crazing on the sugar bowl, does not show in the pics. RS Silesia Cream and Sugar - Art Deco Pink Gilded - Pink with Art Deco Design for Coffee Service - 1930s. Perfect with modern streamlined design too. These gems are a great conversation piece. Wonderful little set that will add a touch of elegance to your table.